It’s Day 3 of Thanksgiving Revisited! We’re moving right along here. 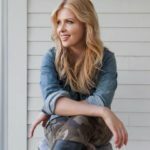 If you’ve been reading this blog for a while you know that I am not a fan of doing dirty dishes. I love spreading out in the kitchen and making a beautiful mess. But I have a hard time facing a big stack in the sink. 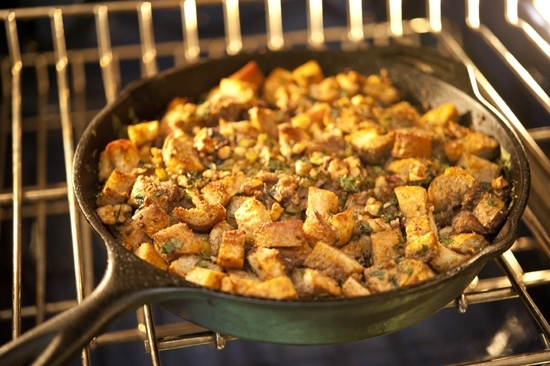 That is why I love skillets and why I love this stuffing… all of the cooking happens in one beautiful pan. Of course I’m showing you all of the ingredients in a bunch of dishes. 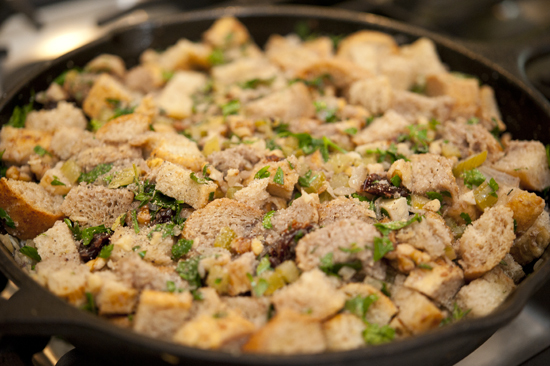 But you don’t need to set things out in so many bowls, I just want you to see what we’re working with here: stale bread cut into cubes, white wine, walnut pieces, dried cherries (or currants or cranberries), diced celery, butter, fresh thyme, chopped garlic, minced shallots, and chopped parsley. 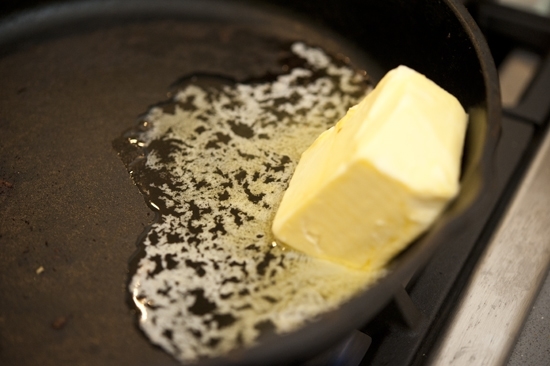 Start by melting a nice hunk of butter in a skillet. 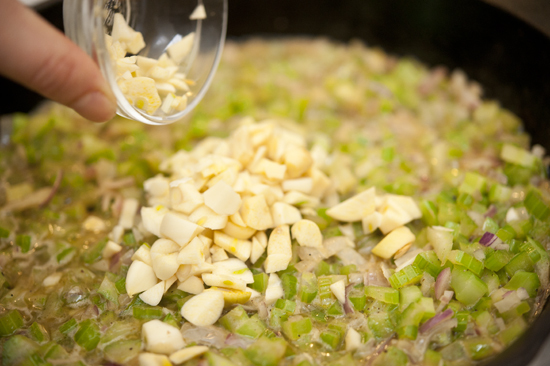 Add the shallots and the celery and let is simmer and sweat and smell delicious. Season with salt and pepper to really let things release their juices. Next add the garlic and let that simmer and sweat and smell delicious too. Pour in the wine and let it reduce by half. Stir it every so often to mix up the flavors. It will be a pool of golden buttery goodness. 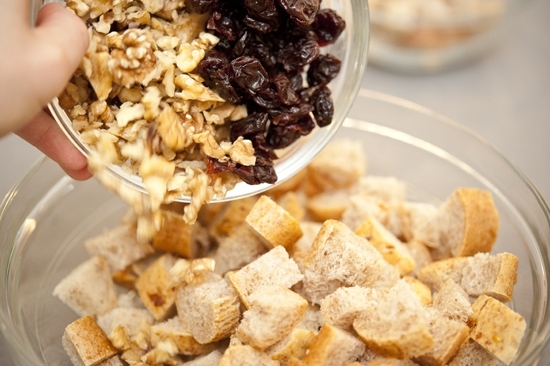 Meanwhile, in a bowl, combine the bread, walnuts and dried cherries. Then the thyme… is there anything better than the smell of freshly picked thyme? I think not. Then the parsley. 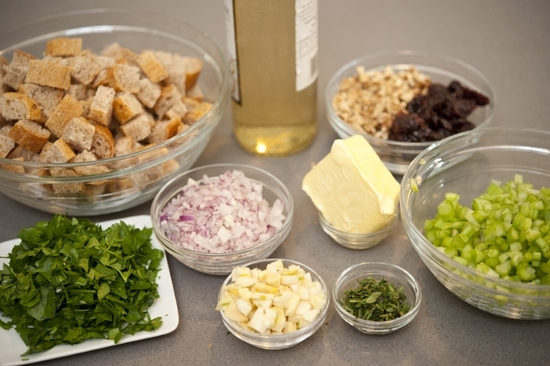 Mix it all together very well and sprinkle in a little salt and pepper while you’re at it. 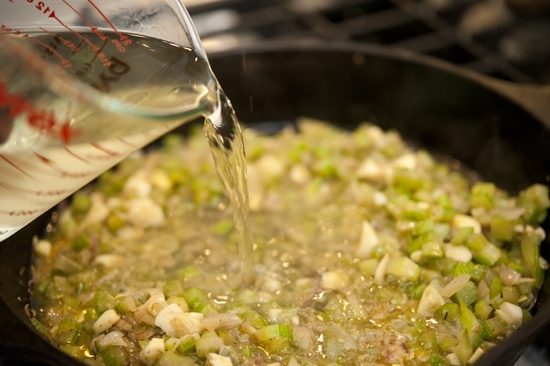 Add the mixture to the reduced wine in the skillet. Stir it around well so that it soaks up the wine evenly. Pat it down nicely so that it has a flat surface and is packed in. Bake it in the oven uncovered so that the top forms a nice crust and is golden brown. 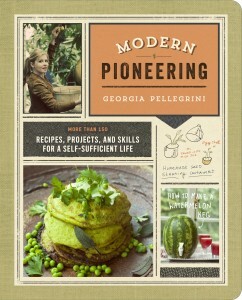 And in not too long, you will have a one dish wonder. And the best part? 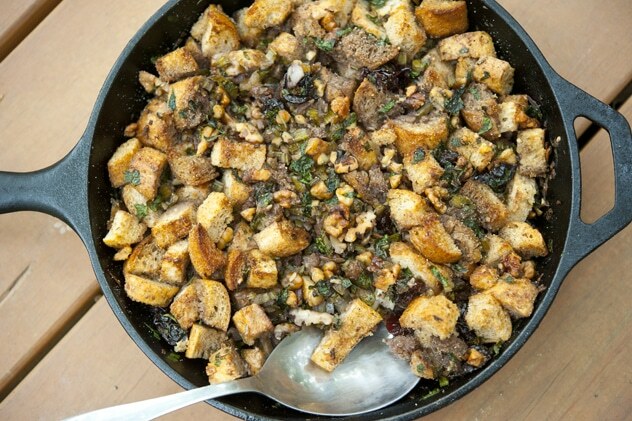 Once you’ve consumed all of the stuffing, the empty skillet can be wiped out with some paper towel and you won’t need to wash it! Give this a try, it’s my favorite stuffing. 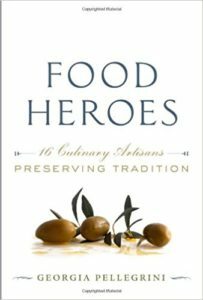 And it is especially good to use to stuff game birds. 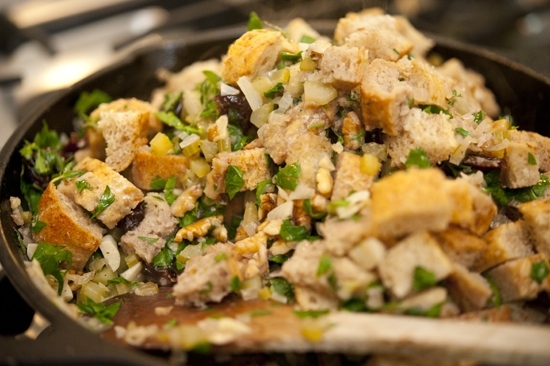 Sometimes, I use bread crumbs instead of croutons to stuff the small birds and it is heavenly. Enjoy! 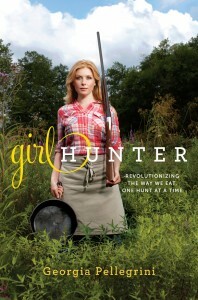 Preheat the oven to 350 degrees F. Melt the butter in an 8-inch cast iron skillet over low-medium heat. 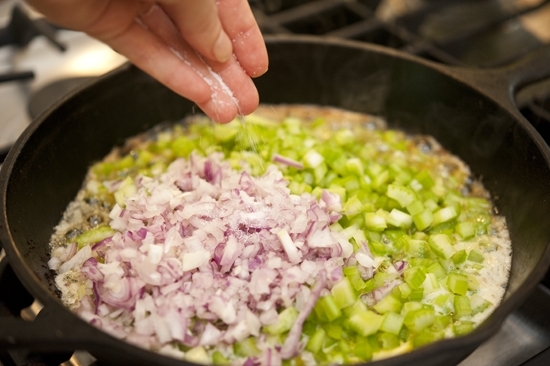 Add the shallots and celery and sweat until soft and translucent, about 5 minutes. Add the garlic and continue to sweat another 3-5 minutes. 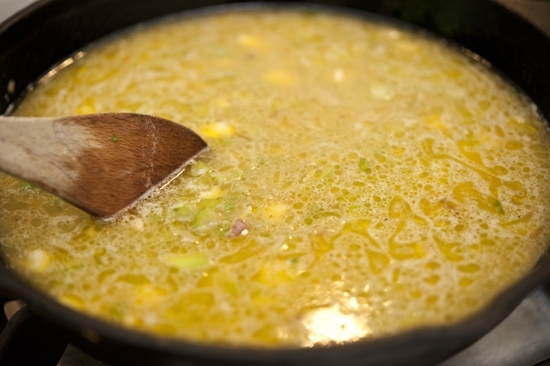 Add the white wine and let simmer until the liquid is reduced by half. 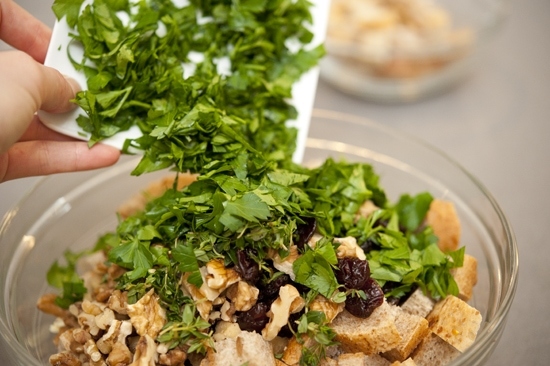 Meanwhile, combine the walnuts, currants, bread, parsley, and thyme in a medium-sized bowl. 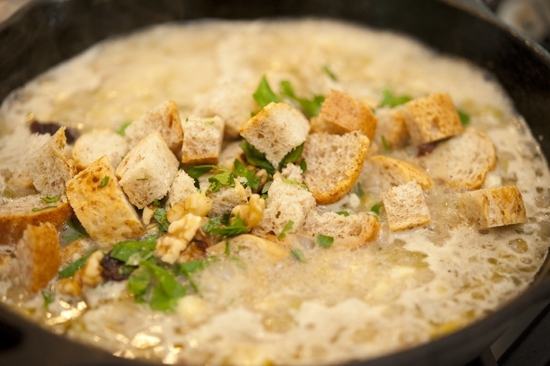 Once the wine is reduced, add the bread mixture to the skillet and toss with a spoon until uniformly moist. Distribute the mixture evenly in the pan and season with salt and pepper. Place in the pre-heated oven and bake for about 30 minutes, until the top is golden brown and crusty. 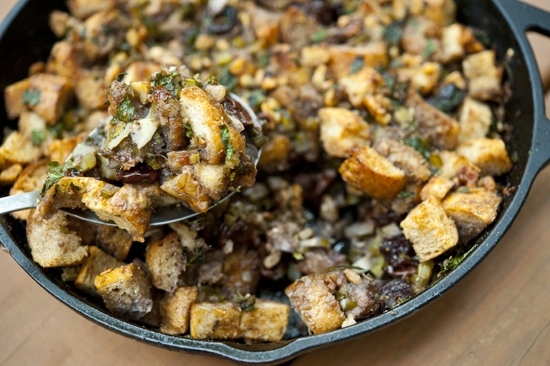 Best stuffing I’ve ever made or ever had. 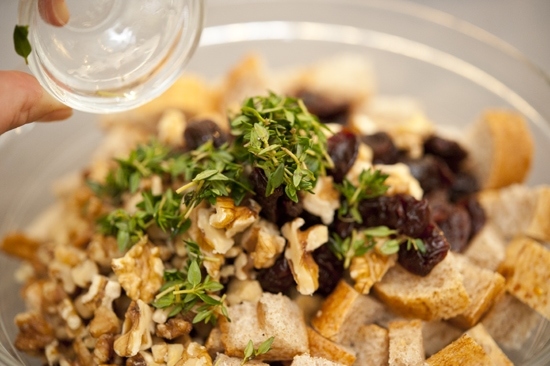 Brilliant recipe that even a culinary novice can complete with ease. Hurray Booker! I’m so happy you enjoyed it.